Yes we had fun, the grand kids found many items they "needed". All those sacks were just on the 2 hooks. They work great. I had a TravelScoot adventure with my hubby today. 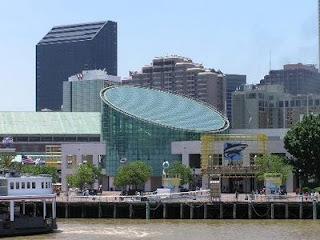 We started out at Bass Pro, which is a combination of a theme park and sporting goods store. Seriously, they had a pond IN the store with ducks, turtles and fish and there were also huge aquariums. Some marketing genius did a terrific job designing the store. After that we went to Ralph's Supermarket, a local grocery store we'd never been in. 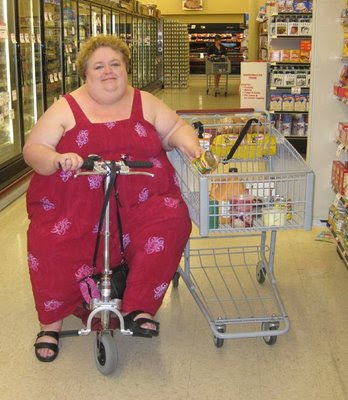 This photo shows how I shop for groceries (and that you CAN wear a dress while scooting). Alan was with me today, but I shop this way when I'm by myself too. If I get in a narrower space, I'm able to reach back and pull the shopping cart behind me. Here my new hooks are, attached to the cane. Since these latch closed, I thought I would carry my camera and wallet on these hooks. I am glad they came today my sister, daughter and 2 grand daughters will be here tomorrow and we will be out and about. I received my TravelScoot Travel Kit today. They are good quality items, and nicely made. The bag that protects the controls is much thicker material than the black bag that comes with the scooter. There's a piece of velcro that holds it in place. Also, the color in the picture looks dark pink on my monitor, but it's actually the same color as the fabric caddy. The battery bag is the perfect size to hold two of the lithium ion batteries. I'll definitely be using mine to hold the battery (or batteries!) when I fly. I also like it that it has the TravelScoot emblem on it. It makes it look like it belongs with the scoot. The buggy hooks arrived today so I took some pictures. They look like they will work great. After attaching them I pulled on them to try to get them to slide down the steering upright, and they did not move. Also when my 2nd set of hooks arrive I am going to attach them to my cane. I think it will work just fine for holding two more shopping bags if I need to use them. 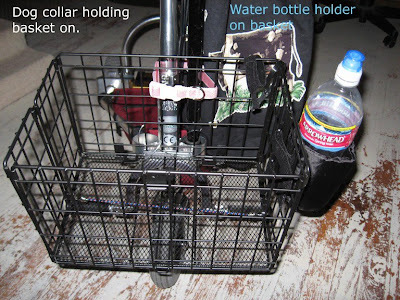 The water bottle holders I purchased will not attach to the upright but they attach to the basket just fine. I found more information on the hooks Cynth posted about. 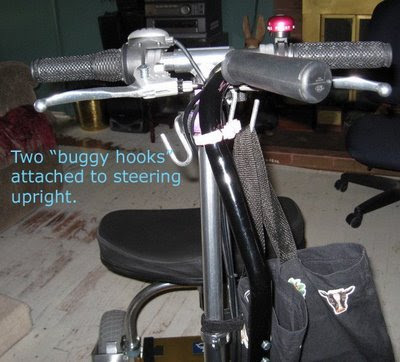 They're called Think King Mighty Buggy Hooks. They also have a cup holder that sounds like a great accessory. 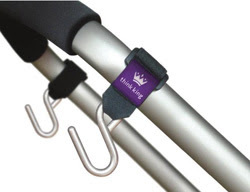 Think King sells the hooks in packs of 2 on their website for $14.99. They have a drink holder for $14.99 too, that holds more than just drinks. They have open hooks. 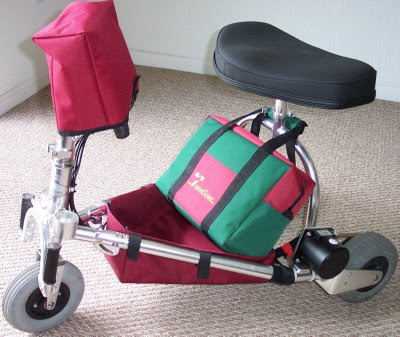 I hope between the 2 types I can rig something up on the front of my scoot so I can do a lot of "this and that" shopping with canvas totes instead of a shopping cart. I spent an hour and a half looking through home depot today trying to come up with ideas for some tote hooks and what not for the TravelScoot. I messed with doweling and looked at all sorts of hooks and connectors. Then I came home and googled "clamps" and found no-slip grip-clips for wheel chairs. They look like they will work just attached to the steering column. I ordered some and will let you know how they work out. the middle picture 2nd down. I must say it was lovely to cruse Home Depot without dragging a shopping cart around. Cynth, I can't wait to hear how these work. They look wonderful! Rhonda sent me an email today letting me know that she was on an adventure with her hubby and 10-year-old son, at the New Orleans Aquarium. What is so special about this trip is that she wouldn't have been able to go without her TravelScoot without the fear of when her next asthma attack would occur. 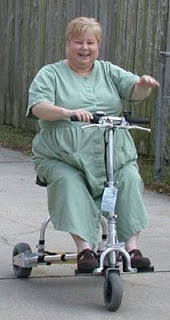 The first day Rhonda used her TravelScoot to go to work she told me she felt liberated. I have to agree with her! little children loose. Having a great time ... Wish you were here." This is an announcement for the NAAFA Convention, being held in Washington, D.C. from July 30 through August 3, 2009. I will be giving a workshop where I'll talk about the TravelScoot, and Hardy Huber (the TravelScoot inventor) will be there too. More information about the convention is available on NAAFA's website, at http://www.NAAFA.org. 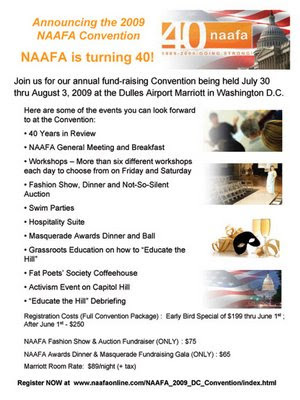 NAAFA Is Turning 40 and we are having a convention celebration that you won't want to miss! Join us for our annual fund-raising Convention being held July 30 thru August 3, 2009 at the Dulles Airport Marriott in Washington D.C. You may register to join us through our website at www.naafa.org. We are forty years old and going strong with the strength we need to build the future. This year's convention will be packed with learning, networking, community building, swimming, dancing and more. Friday night's 2009 NAAFA Fashion Show is promising to be the country's premier plus size fashion show with dinner and fashion plus our well-known Not-So-Silent Auction. Don't forget your prettiest party clothes for Saturday Night's Awards Dinner and Masquerade Gala as we share a sumptuous meal and dance the night away. Sunday we will learn from knowledgeable experts the most effective ways of working to change our laws then on Monday August 3rd we will visit key representatives and organizations to present our case for changing this country's anti-discrimination laws. You won't want to miss this opportunity to be involved. We have worked hard to keep the cost of this convention down and have made it easy for you to register for the convention as well as the hotel at www.naafa.org. Our earlybird special thru June 1 is only $199.00. We encourage you to register for the full package today and to fully participate in this exciting, life-changing event. 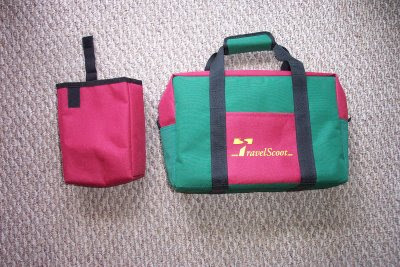 There's a new travel kit available for your TravelScoot. 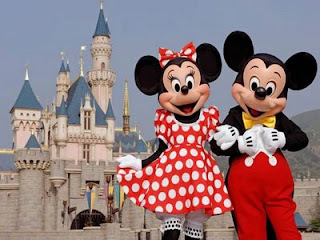 It's available for $39 through the TravelScoot website, at http://www.travelscoot.com/. In the post titled, "A New and Easier Way of Airline Travel," these are items *1 and *2. My experience has been, when the entire scooter is stored inside the bag, the airport baggage handler treats it like just another bag and often does not handle it with the proper care. This occasionally leads to damage on scooter and/or bag. Also, airport personnel don’t always realize that they are dealing with a mobility device inside the bag; once in a while they ignore the gate check tag and forward the bag containing the scooter to baggage claim. 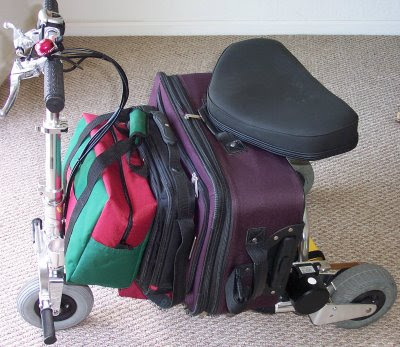 Below I describe a way to transport the TravelScoot that allows airport personnel to clearly see that it is a mobility aid. Furthermore, this method practically forces them to use both hands when carrying the TravelScoot (up and down the gangway steps, for example), resulting in more careful handling. I have traveled this way already several times, and not once was my TravelScoot damaged. 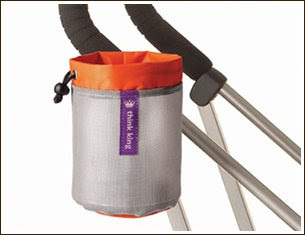 Also, when traveling, I no longer fold the TravelScoot, and I leave its carrying bag at home. Before you start your trip, be organized. Your carry-on luggage shall fit underneath your seat across the trailing arms. Like your carry-on luggage, your check-in luggage should have rollers. You can also take a spare battery. In order to reduce the number of items you have to deal with while roaming at the airports, best is to pack the back rest and its elbow frame as well as the optional folding basket in your carry-on or checked luggage, and drive the TravelScoot without the back rest. 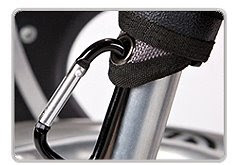 This also makes getting on and off easier when carry-on luggage is placed on the frame (see picture above). The rider can swing his or her leg over the seat from the rear, much like on a man’s bicycle. At the airport, when you set up your TravelScoot, stack the second battery on top of the main battery. If you are traveling alone, tow your check-in suitcase with your left hand and drive to the check-in counter. Drive slowly because you can apply only one brake. At the check-in, remain seated so that an employee will understand that you have walking problems. It will happen either at the check-in or more likely at the gate counter, that you will receive the “Gate delivery” tags for the scooter. Ask for a second tag for the heavier batteries. At the security checkpoint, you can usually bypass the waiting crowd, ask for assistance. They ask you whether or not you can stand up. You could remain seated but be aware that you may be subjected to a body search. To avoid this embarrassing procedure, better stand up and walk the few yards through the x-ray frame. They will perform a security check on your scooter. After you are cleared you can proceed to the gate. Park in the vicinity of the counter. Disabled persons with their equipment are asked to board before the rest of the passengers. At the door of aircraft you are boarding slide the two handles with the controls out of the T-handle, slide the padded sleeve *1 over it, and lower the steering column almost all the way. Remove the batteries and store them the padded battery bag *2. Remove the batteries and store them the padded battery bag. If you travel with the light batteries, temporarily remove the seat, slide the battery bag's handles over the seat support and replace the seat on the seat support. Now it's a fairly compact item and easy for the airline personnel to handle. If you travel with one or two heavy batteries, the bag must remain separately because of the weight; it shall not be attached to the scooter. Keep in mind that the airline handler (sometimes female) must carry everything up and down the narrow stairs outside the gangway. Ask the gate desk attendant for two gate check tags. After arrival stay seated until most of the passengers are gone because usually it takes a while until gate checked items are delivered. 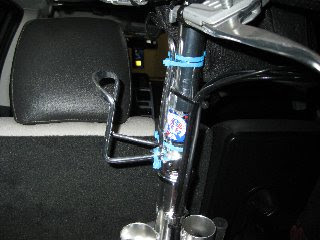 I had an idea today about using those cane cups for something useful like maybe a place to hold the end of some kind of upright that also fastens some how at the top of the steering upright. 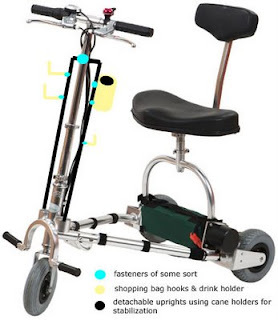 The uprights could be used to add "tools" to the scoot like a drink holder and shopping hooks so the basket could also be used to give more options on carrying things while shopping. On Saturday, Melissa, Rhonda and I went on an adventure. (Melissa's in blue above, and Rhonda's in pink.) It was day #3 for Rhonda's TravelScoot, and we wanted to break it in right, so we went to the mall. We started by loading both scoots into the back of my Honda Odyssey, then off we went to Sephora, then the Apple store, lunch at a sidewalk cafe, Pottery Barn, Dillards, and many stops in between. We just about walked Melissa's legs off, I think. After the mall we headed to Bed, Bath and Beyond. We were barely in the store before a woman ran after us to get more information. 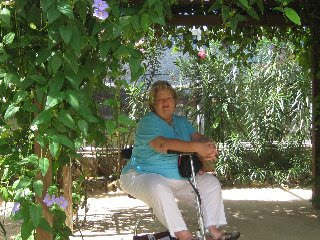 She has a sister who would benefit enormously from a TravelScoot. We were also able to talk to her about the exercise classes Melissa teaches, and she said she and her sisters would see us there. I don't know anything about the company that sells these, but this cart looks interesting. I wonder how well it would work with the TravelScoot for shopping? A detachable rotating handle is also available. 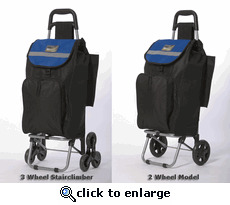 It has a 100-lb weight capacity, and if you take the bag off you can use it as a dolly. With a little quick thinking she decided to stay on the scoot, turn it around and give it a hard push off with her feet to head back down the incline. The battery quickly turned from red to green. She's sure it didn't look graceful, but it worked! If you're concerned about this happening to you, you can always choose the sealed lead acid battery instead. It doesn't overload. I chose the lithium ion battery instead because it weighs 4 1/2 lbs instead of 20 lbs., it can be charged at any time without damaging the battery, and did I mention it only weighs 4 1/2 lbs? More information about the differences in the batteries is at http://www.TravelScoot.com/batteries.htm . The first picture is Bee at the butterfly farm. The second one is Sarge and their cruise director racing the scoots. You can see the cup holder on the front of Bee's scoot. The third and forth pictures are taken from the front and side. 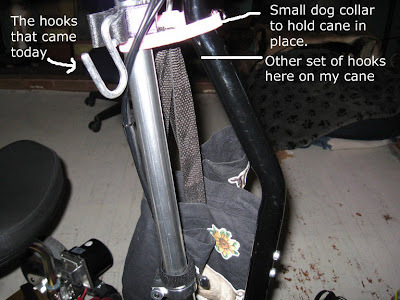 Sarge said it is mounted [with wire ties] in the front so the scooter can fold up and below the compression ring where the top part of the handlebars telescope in. It was originally mounted with velcro, but Bee said that didn't work well. Thanks for the pictures, Bee! Your assignment (should you choose to accept it) is to find the best cup holder out there for our TravelScoots. 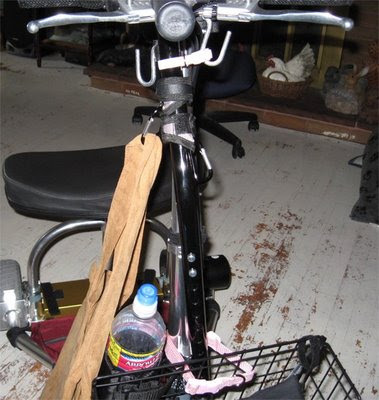 If you do a google search for "Microphone stand cup holder", "bicycle cup holder" or "wheelchair cup holder" you'll see many options. 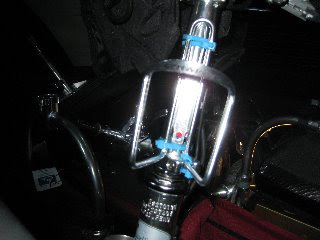 I don't think attaching a cup holder to the handlebars is going to be an option, which makes me think the microphone stand cup holder might work best, since it can be attached to a vertical piece. My sister Rae is the one who came up with this idea. Here's one product that might work. Look at the SwirlyGig II. Has anyone found other accessories that work with the TravelScoot? Yesterday UPS delivered my friend Rhonda's TravelScoot. I went to her house last night to help get it set up (which took about 5 minutes), and to ride together to test it out. We had a blast riding through her neighborhood on our scoots. We drove them as fast as they would go. As expected, she can go a little faster than me because I'm a lot larger than she is. We rode a mile or more (I'm not a good judge of distance) and when we came back to her house at full speed she didn't have any trouble getting up the driveway, but my battery overloaded. It was the perfect opportunity for me to try restarting it by giving the scoot a hard push. I got off and pushed it two or three times and I'd see a red flash on the battery panel, but nothing else. Well, that's when Mark, her wonderful 10-year-old son, came to the rescue. He took off at a run, pushing my scooter, and got the battery restarted almost immediately. If your battery overloads and you don't have a 10-year-old boy handy, you can also plug the battery into the charger briefly and that's supposed to reset it too. The picture on top is of the best mom in the world -- mine! 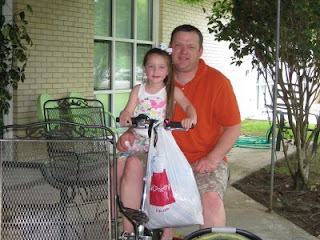 The second photo is my nephew Shane and my great niece Baylen, sitting on my TravelScoot. 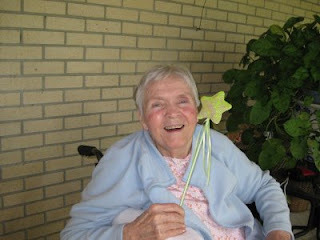 We were celebrating Mother's Day at my mom's nursing home. Shane was impressed with my TravelScoot, but not as impressed as Baylen was with the bell. There's not always a bag hanging from the handlebars! We were almost finished shopping at this point. Rae and Kelli left me in charge of watching the packages so they had their arms free to try on shoes. It seemed like a good photo op. I was certainly carrying my share of the packages! I know most people don't take pictures when they go to the mall, but going to the mall is impossible for me without my scoot. I had a WONDERFUL day of independence and freedom, and that was worth photographing. This is my sister Rae. You can see a tiny bit of the handlebar peaking out from under the clothes. We were in a small dressing room. Me, her, a chair, and my scoot. Here I am in JC Penney's, shopping for clothes for my mom. Yes, the racks were close together, and YES, I was driving in between them. You can't tell from this picture, but I could actually drive my TravelScoot without moving the clothes that are piled on top of it. 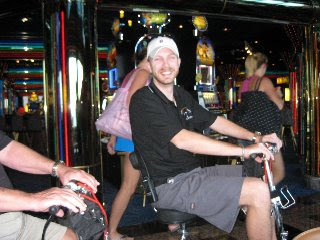 I just put my hands under them to reach the handle bars. This picture was taken today outside the Mall of Louisiana in Baton Rouge. The little pink pouch attached to the handlebars is my camera bag. This picture was taken at the beginning of our shopping trip today. Look, no bags! 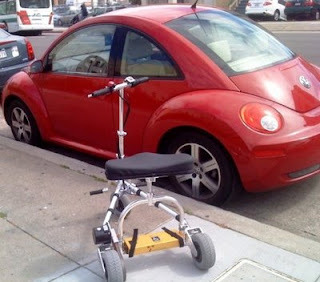 This is Lynn Ellen's travelScoot parked by her VW. It's hard to believe that scoot fits in what looks like a tiny trunk, but it does! 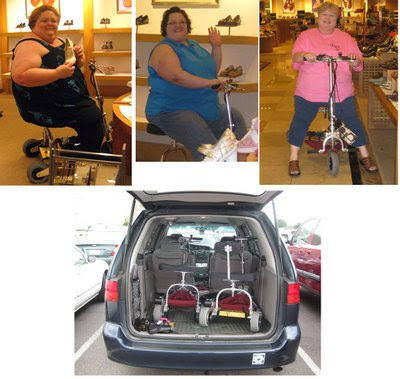 I have a friend from exercise class who just took her new TravelScoot to Disney. She was there for three days. Normally she rents a scooter, so this was her first time taking her TravelScoot. Let me see how much I can remember of what she told me. Airport: She got a gate check tag for it when she checked in, then rode it to the door of the plane. The man who checked it was fascinated by it. She was VERY happy about not having to walk in the airport. I don't know about all of you, but airports are a real problem for me. I know many airports have carts you can ride in, but it's hard to find one when you need it and it doesn't take you to baggage claim or to your hotel transportation, but the Travelscoot will! Busses: It was much easier to take her scoot on the busses than it was to take the scooters she rented in the past. At the park: LOTS and LOTS of people asked her about her scoot. She said she wishes she had had business cards to give out. Shopping: The Travelscoot fit in all the little shops at the park, and it was easy to go between the aisles too. That's difficult to do (and sometimes impossible) with a regular scooter. Battery Life: She took her charger to the park just in case, but never needed it. She said the battery life was great. Triangle-shaped carrying pouch: She was amazed at how much she could fit in this pouch. 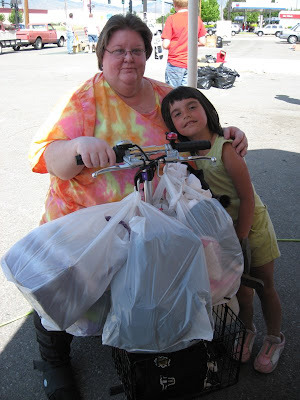 She was in charge of purses and shopping bags. Batteries: Hardy Huber now has more lithium ion batteries in stock. He'd been out for a few weeks. Bigger Seats: I have the prototype for the new, larger seat. Hardy says he'll have more in and available for shipping in the middle of July. If you buy your TravelScoot before then he'll send the regular seat (which works well), and trade out for the larger seat when they come in. Sorry the picture is a bit dark, but the seat on the left is the regular seat and the one on the right is the wider and deeper one. 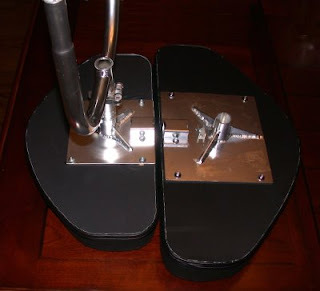 The seat is turned upside down, and the one on the left has the metal part attached that attaches to the base of the scoot.